The knitted cast on is easy to do, especially if you already know how to make a knit stitch. This is a good all-purpose cast on and creates a stretchy edge to your work. 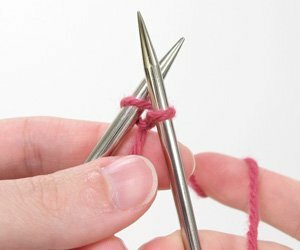 Start with a slip knot on the needle in your left hand. Use your fingers to hold the yarn tail out of the way. 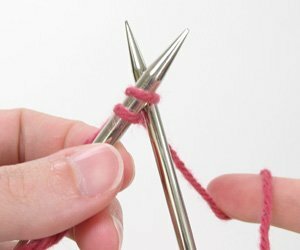 Insert the right needle into the slip knot and work a knit stitch, but do NOT slip it off of the left needle. Tilt the right needle to the right and insert the left needle into the loop you’ve pulled up. You are now in position to complete another knit stitch. Repeat the instructions, as you did when you worked the slip knot above. 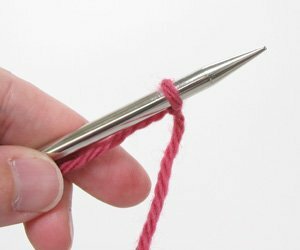 Tip: If you are having a hard time working your left needle tip into the loop on the right needle, try pulling up a larger loop when you work the knit stitch. This entry was posted in Casting On, Video Tutorials, View All by Knit Picks Tutorials. Bookmark the permalink.